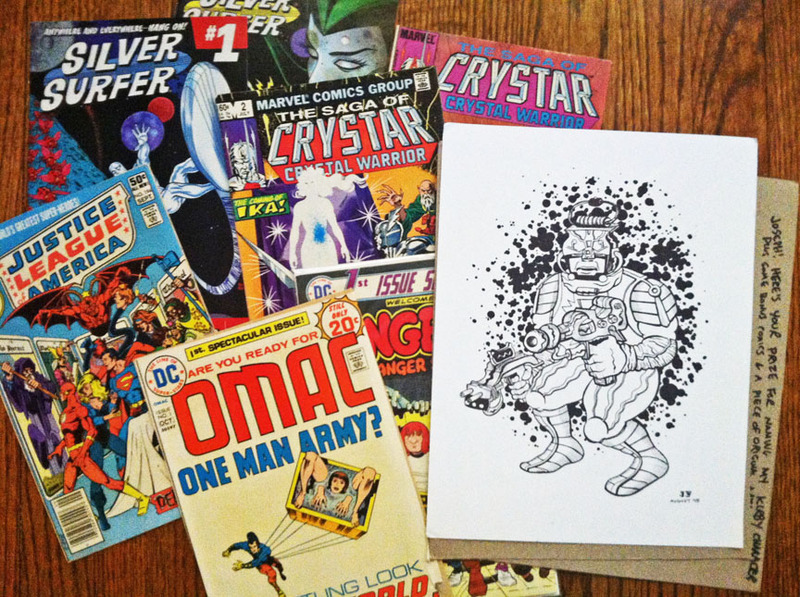 Name Jason’s Kirby Homage Contest prize! I kid you not, a bird delivered this to my door. Like straight up Harry Potter style. I had just checked my email and saw that Jason had written me back. Not only had he replied favorably to my latest message, he also informed me that I had won his name a character contest and that I should expect my prize in the mail. It took me a moment to recall what contest he was talking about and then it hit me as I navigated over to his webpage. It had just been the King’s 98th birthday and Jason chose to homage Jack Kirby with an amazing stylized character concept. I was lucky enough to catch the post and weighed in after ‘Kracklus’ with a rather blunt sobriquet ‘Lantern-Head’. I encourage you to visit the Original post for an accurate run down of the events. As I was sending my reply to Jason there was a sound at the front of the house. A ‘rapping’ if you will. Perhaps someone was tapping on the glass? I got up and went to look and there was no one there. And then the sound came again! I looked out the window and there was a finch tapping on the siding, and then I noticed this huge envelope sticking out of the mail box. The prizes keep on coming! TGIF!